INTERIOR DESIGN - The Japanese interior design firm Wonderwall, renowned for their work with streetwear label A Bathing Ape have worked their magic on a new store for Godiva located in Harajuku. 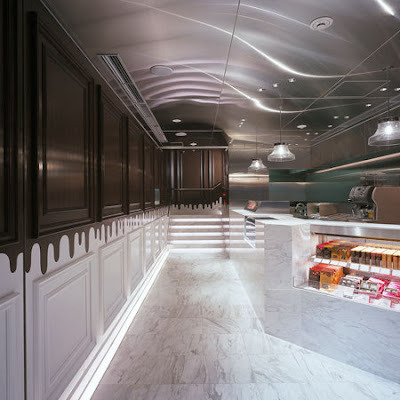 "This is Godiva’s new concept flagship store. Godiva’s idea was “treat thyself”. Wonderwall’s intention was to add a breath of fresh air to the more traditional image Godiva instill. 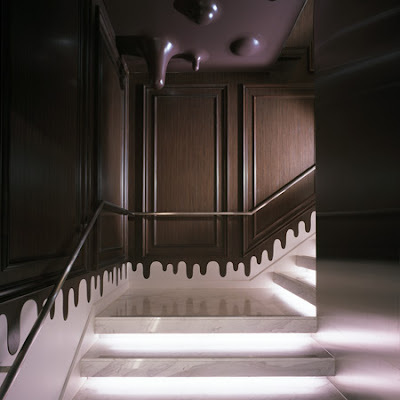 The shop features humorous design details such as “melting chocolate” ceiling combined with the primarily classsical interior design. The boutique’s popular and fashionable location of Harajuku has also been considered in the overall design. Passers-by can view both its entrance as well as the costumers enjoying their time with chocolate on the second floor cafe."